Born in England and raised in Bengal, Sri Aurobindo’s youngest brother Barindra Kumar Ghose (1880-1959) joined the revolutionary movement around 1902 and went on to become the head of the Maniktolla Secret Society. Between 1906 and 1908 along with his associates he tried to assassinate a number of British officials. Following an unsuccessful attempt to kill Mr. Kingsford, the District Magistrate of Muzaffarpur, he was arrested in May 1908 along with Sri Aurobindo and his other colleagues. The prisoners of this trial—which became famous as the Alipore Bomb Trial—were tried for conspiring to wage war against the King of England. Barindra Kumar was sentenced to death in 1909 but later the death-sentence was commuted to life-imprisonment in the Andaman Islands penal colony. During his imprisonment in Alipore Central Jail, Barindra Kumar had written some letters to his sister Sarojini. Three of these letters have been published in the online forum of Overman Foundation. We are thankful to Mr. Biswajit Ganguli of Sri Aurobindo Bhavan, Kolkata, for discovering these letters and allowing us to publish them in the forum of Overman Foundation. We are all well here. So long we were kept separately in different cells. Now they have put us together in a large cell composed of four rooms. So life is more bearable now. Please don’t fail to let me know how you are all doing. There are Rs. 300 left by Abinash  in a box, the key of which is left with you. If you at all have to take out of it for Mother do so only when every other source for raising money fails. If we at all spend out of that money Sejadada  will repay. You can very well imagine how difficult it will be for him to repay under the circumstances. My best love and respect for you all. Please send me a few clean cloths soon. My Sessions case comes on next Monday, I believe. Want of clean suits will inconvenience me very much. Two pairs of dhuties, two underwears and two towels will do for the present. They are rather strict now-a-days about interviews. All the same you may come, only we have to talk from behind bars. You may have to submit to search for all I know. However, I hope you will bear that for my sake. Give respect and love to all. I am alright. I had slight fever for a day. We are in solitary cells, but this is good for me in one way. I am left all to myself the whole day and night and can live in Her—our divine Mother. More when we meet. It is a long time since we have not met, I believe, it is the new order of things here that keeps you away. If you do not like to come here, you can see us in court. Our Judge Beachcroft is very kind in that way. I am sure he will see his way to grant the interview, and our father’s friend the Court Inspector Mr. Rahim will be there to arrange it. So you need not feel frightened about it at all. I shall trouble you about a certain thing. Please write for me a letter to Sj. Rash Behari Bose, Judge, Tipperah enquiring after my step-mother  ’s address at Benares. If he does not know his son Surendra is sure to know; so you can get Suren’s address as well from his father. I should like to see mother once for the last time before the case is over and have got to arrange for her maintenance. More when we meet. My love for you and for all. I am sorry to hear about uncle’s deportation, but the Government is sure to release him as soon as the country is quiet. May God keep you all happy and well. I am sure He will do the best for me as well. Abinash Chandra Bhattacharya (5.4.1882-10.5.1962) was Barindra Kumar’s first recruit. He was the publisher of Mukti Kon Pathe (Which Way to Liberation) and Bartaman Rananiti (Modern Science of War). 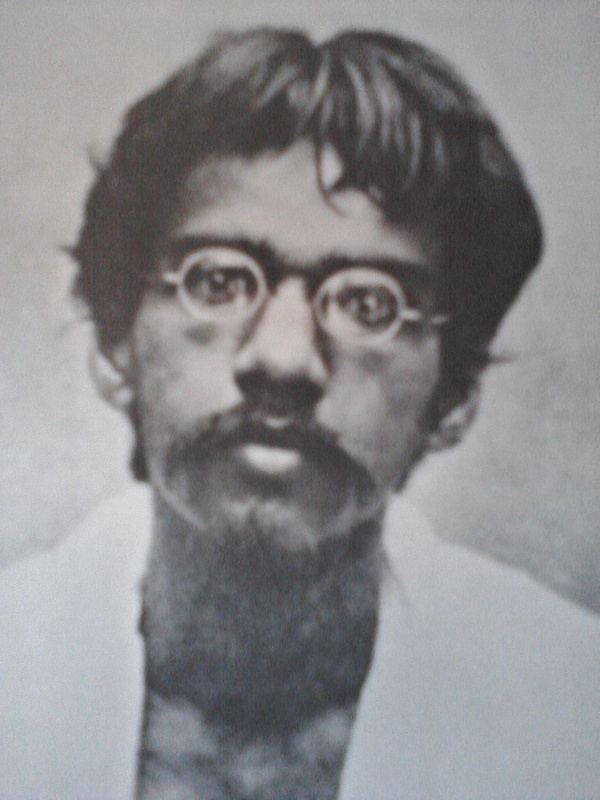 He was the first prisoner of the Alipore Bomb Trial to return from the Andamans. His published works include titles like Bahirbharate Bharater Muktiprayasa, Ranosojjaye Germany, Swaraj Sadhana, Mukti Sadhana, Germany Probasipatro, Europe a Bharatio Biplober Sadhana, etc. Certainly intimate and touching. They had come to do work for India. Very touching indeed. My respects to these who were clearly giants amongst men. this bring tears, what a suffrung these freedom fighters have undergone, but to day most of the leaders have become corrupt and selfish. who is going to take an avatar to save the country from demons. Our freedom fighters sacrificed all for the sake of the country. The country was Divine Mother to them. Now we are living in diffferent world. We have lost that spirit. It is really a pity. My Lord, It was so touching. Salute to all the enlightened souls who gave us life. Let us learn to gather strength from their lessons at our individual levels.Our country is need of that strength today as well!! Very touching. Can we believe that such persons existed just a century before. I knew Barin da only as Sri Aurobindo’s brother and revolutionary.. monumental courage, limitless sacrifices, unshakable faith in the mission of renaissance of Mother India. Helped me a lot.Thank you.